Rocky Mountain HI HOW’S IT GOING? Next weekend — Friday, June 15 through Sunday, June 17 — I’ll be at the Mile High City’s inaugural Denver Comic Con. I’m really excited for this show. I don’t know why. Is it because this is Denver’s first comic convention? Is it the anticipation of preaching the gospel of Cool Jerk to hundreds of comics aficionados who otherwise may never attend San Diego Comic-Con? Is it the big blue bear? I know FOR A FACT that Cool Jerk is read by folks in Montana, Wyoming, Utah, Idaho, New Mexico, Arizona, the Dakotas and Nebraska. * If you happen to live within an 800-mile radius of Denver, please come to the ‘con and show Colorado that you support comics culture and their creators (especially independent, self-publishing wackjobs like myself)! I’d love to meet you and get some ‘Jerk into your hands. Er… sell you some books and stuff. *But not Kansas. Go figure. We’ve never been to Austin or Staple! so we’re really looking forward to this little independent show. We’ve heard nothing but good things about the city, the people and the attendees’ appetite for comics. This will be Cool Jerk’s fifth year at WonderCon! They moved the venue from San Francisco while the Moscone Center is being renovated, so it’ll be interesting to see who makes the pilgrimage down from the Bay Area. Really on the fence about Phoenix Comicon. The last time I tabled there (2010) it seemed more like “early Halloween” than a place for people to buy comics. So I’m likely giving it a pass. 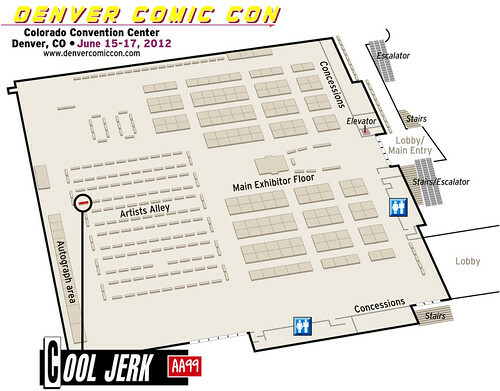 Cool Jerk has never exhibited in Denver, either… and that’s probably because Denver has never had a comic-con before now! The inaugural Denver Comic Con looks to fill the comic-con void in the Rockies, drawing in people from several adjacent states! Ten years in a row for Cool Jerk, in the same spot as always (Small Press K10, next to the restrooms and vomitorium)! In lieu of spring’s Emerald City Comic-Con, Cool Jerk will be attending the second GeekGirlCon in the fall (if they hold a second con — stay tuned). So mark your calendars, put in vacation time, book those flights and bring your wallets!